Cook with Cindy - Food, Fun, and more! 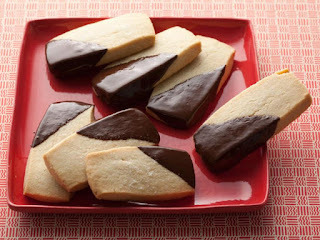 : SHORTBREAD COOKIES! Who doesn't enjoy this 'not too sweet' treat. More butter, than sugar, I do love these cookies. This recipe is from Ina Garten, AKA The Barefoot Contessa. 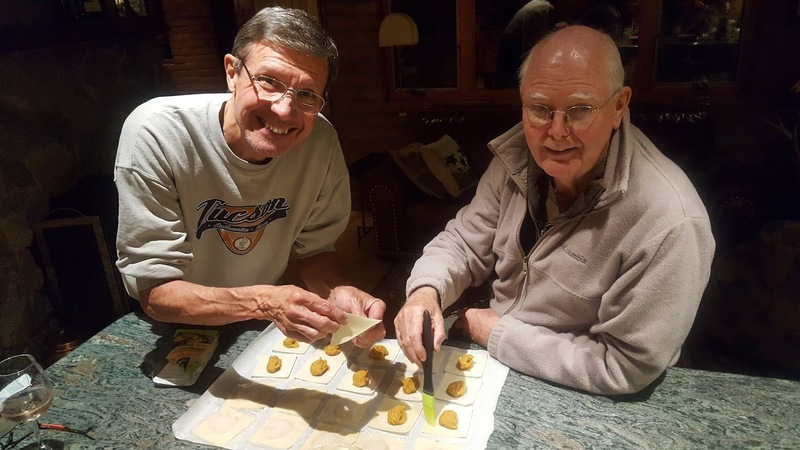 Shortbreads are generally associated with Scotland, but are also very popular throughout the UK, Ireland, Denmark, and Sweden with origins dating back to the 12th Century. Shortbreads from the oven. Cooled and cut. Shortbread cookies get their name from the large quantity of butter (shortening) used to make them, and that is what makes them so delicious. 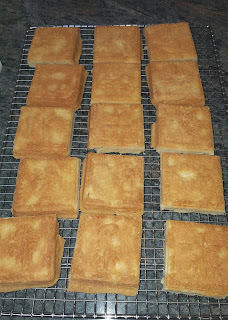 I doubled the recipe as I needed to make 30 cookies and my shortbread mold makes very generous 3" square shortbreads so much larger than the ones Ina uses in her recipe. I'm going to give you Ina's original recipe (not doubled). 6-7 oz. very good semi-sweet chocolate, finely chopped. 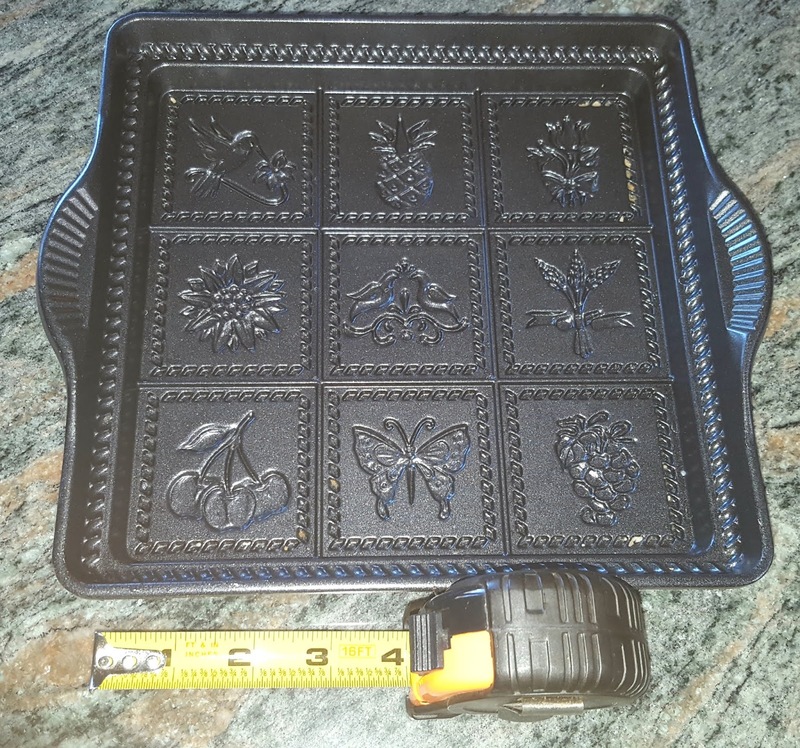 I did not use the chocolate since I made my cookies into a mold, rather than a 3x1" finger-shaped cutter. Preheat oven to 350 degrees. In the bowl of an electric mixer fitted with a paddle attachment, mix together the butter and 1 cup of sugar until they are just combined. (Mixing 6 sticks of butter in my standing mixer was no easy feat. The butter kept trying to escape over the top of the bowl!) Add the vanilla. In a medium bowl, sift together the flour, and salt, then add them to the butter and sugar mixture. Mix on low speed until the dough starts to come together. Dump onto surface dusted with flour and shape into a flat disk. Wrap in plastic and chill for 30 minutes. Roll the dough 1/2" thick and cut with a 3 x 1" finger-shaped cutter, OR cut the dough into a 9" x 9" square (or whatever the size of your mold) and press dough into your shortbread mold. This was my first time making. Next time I will press the dough a bit more firmly as the attractive designs did not come through that clearly. 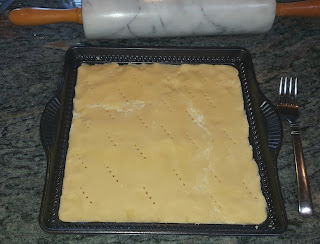 If making in a mold, gently poke holes in the dough with a fork before baking so the shortbread will not rise. Place the cookies on an ungreased baking sheet and sprinkle with sugar. I omitted the sugar as the bottom of the cookie was up, rather than the top. Bake for 20-25 minutes until the edges begin to brown. Allow to cool to room temp. I baked for about 30 minutes until golden. Cool in the mold for about 10 minutes. Loosen the edges with a plastic knife, and invert onto a cutting board. 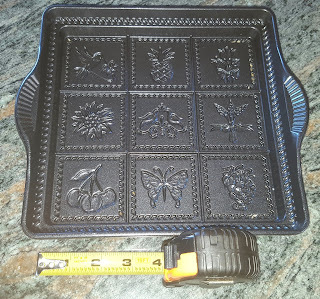 Cut into serving pieces while still warm. Cool completely and store in airtight container or bags. If using the chocolate, put 3 oz. of the chocolate in a glass bowl and microwave on high power for 30 seconds. Continue to heat and stir in 30-second increments until the chocolate is just melted. Add the remaining chocolate and allow it to sit at room temp, stirring often, until it's completely smooth. Stir vigorously until the chocolate is smooth and slightly cooled. Stirring also makes it glossier. Drizzle 1/2 of each cookies with just enough chocolate to coat it. Ina's Shortbread cookies. Aren't they beautiful! Here's another 'not too sweet' treat. This photo is from Adam and Joanne's site, Inspired Taste. I found this recipe online from a blog site called Inspired Taste. 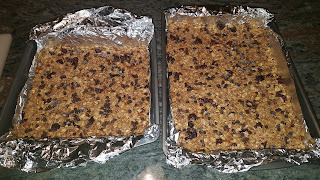 The Granola bars were delicious, but next time I would omit the brown sugar altogether and just use honey for sweetener. As this blogger points out you can add any nuts or dried fruit you like. I did add 1 1/2 cups coconut. I tripled this recipe and would recommend the same. I will give ingredients for both the original and the larger quantity. In some cases I was more generous than the original recipe with nuts/dried fruit. I love the fact these bars are relatively healthy and very easy to make. You don't even bake them. 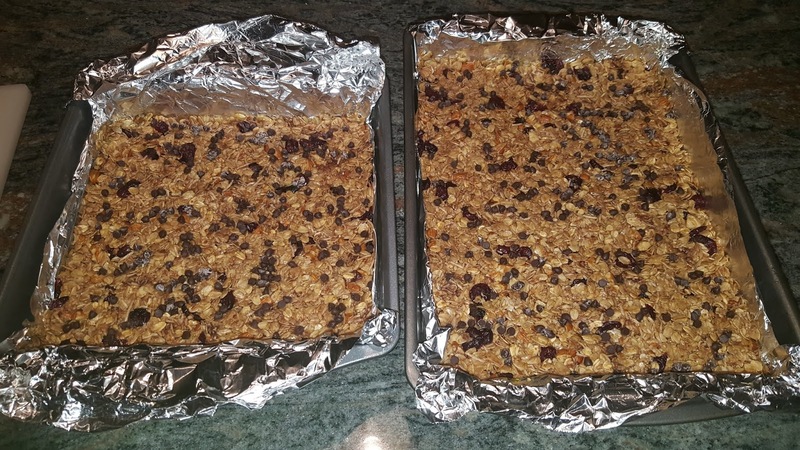 The Granola Bars keep well in an airtight container for about 1 week. Keep in the fridge to allow them to stay a bit firmer or keep at room temp for very soft and chewy. They also freeze well so why not make a bigger batch! Heat oven to 350 degrees. Add oats and almonds to an ungreased baking sheet and bake for 5 minutes. Stir and bake another 3-5 minutes until lightly toasted. Transfer to a large bowl. Line bottom and sides of an 8 or 9 inch pan with aluminum foil. My triple-batch fit perfectly in one 12x17 and one 9x12 sheet pan. Lightly oil or spray with cooking spray. Combine butter, honey, brown sugar (if using), vanilla and salt in a small saucepan over medium heat. Cook, stirring occasionally until butter melts and the sugar completely dissolves. Pour butter mixture into the bowl with oats and almonds. Mix well. Let cool about 5 minutes and then add cranberries and 1/4 cup (or 3/4 cup if tripling) of the chocolate chips. Stir to combine. The chocolate chips will start to melt. This is not a problem and helps hold the bars together. Transfer oat mixture to lined pan(s) then use a rubber spatula or damp finger tips to firmly press the mixture into the pan. Press hard here to help the bars stay together. Joanne and Adam recommend pressing for about 1 minute to ensure that bars don't crumble when you begin to cut them. I pressed for about 2 minutes to be doubly sure. 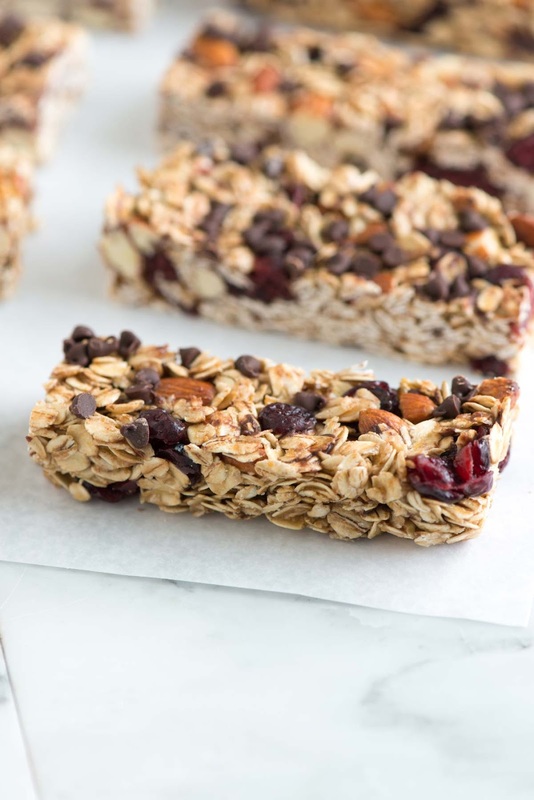 Scatter remaining chocolate chips over pressed granola mixture then use a rubber spatula to gently press them into the top. Cover and refrigerate for at least 2 hours. I kept mine in fridge for about 5 hours. Remove block of granola mixture from the pan then peel away aluminum foil. Cut into bars about 1" wide and 4" long. 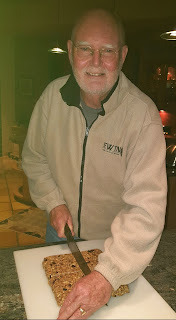 ﻿My husband, Jerry's birthday is next week, November 13th. 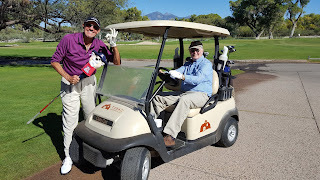 He and our good friend, Dennis Makes share the day and we have celebrated their birthday's together for many years. 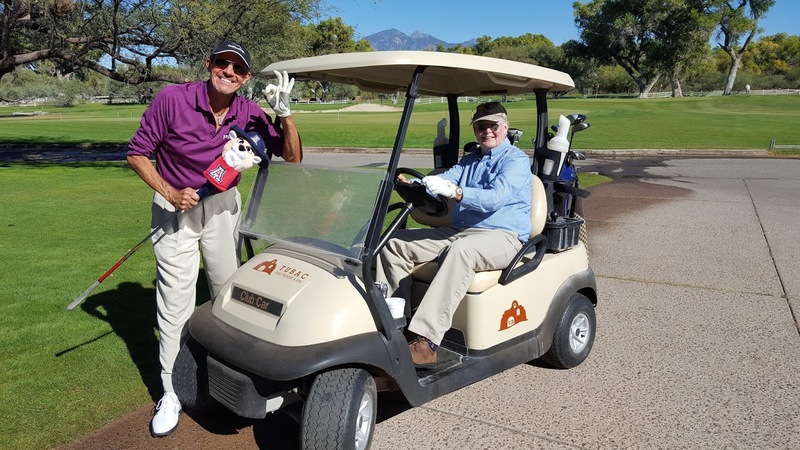 Sadly, this is the first birthday without Dennis, as he passed away on October 5, 2018, but we will continue to lift our hearts and celebrate his life along with my Jerry's. Pumpkin Ravioli's for the birthday feast. I CONSIDER NOVEMBER 13TH THE OFFICAL KICK-OFF TO HOLIDAY SEASON. THIS YEAR FOR JERRY'S BIRTHDAY I AM MAKING ROAST RACK OF LAMB WITH MUSTARD AND GARLIC CRUMB TOPPING, BOURSIN MASHED POTATOES AND ROASTED ASPARAGUS. DESSERT: SALTED CARAMEL ICE CREAM. WISHING YOU HEALTH AND HAPPINESS AS YOU COOK INTO THE HOLIDAYS!